I had traveled with Arsviva, a Czech tour company that specialized in trips that emphasized art and architecture, to Sicily for 11 days in May and had enjoyed a thrilling experience full of breathtaking sights, all made more fascinating thanks to a terrific guide. This time I was on a day trip to sample Cubist architecture in central Bohemia. As we started out at seven in the morning, I thought to myself how I had always been attracted to Cubism and to the way the style assembled shapes in abstract forms utilizing many perspectives. I had found the Pablo Picasso museums in Paris and Barcelona to be breathtaking. Georges Braque’s work also bewitched me, especially in the Centre Georges Pompidou. In terms of Czech Cubism, I was most drawn to the paintings of Josef Čapek, who had also, along with his exceptionally talented brother Karel, scribed some impressive plays. First, we went to the Evangelist church in the village of Pečky. The monument to Jan Hus near the church reminded me of the first time I had seen the monument to the 15th century martyr on Prague’s Old Town Square, a place where I immediately felt a sense of belonging during my visit as a tourist in 1991. Hus had been a Czech priest, reformer, philosopher and teacher who was burned at the stake on July 6, 1415 for not preaching according to the doctrines of the Catholic Church; he stands out as a leading light of the Bohemian protestant reformation. 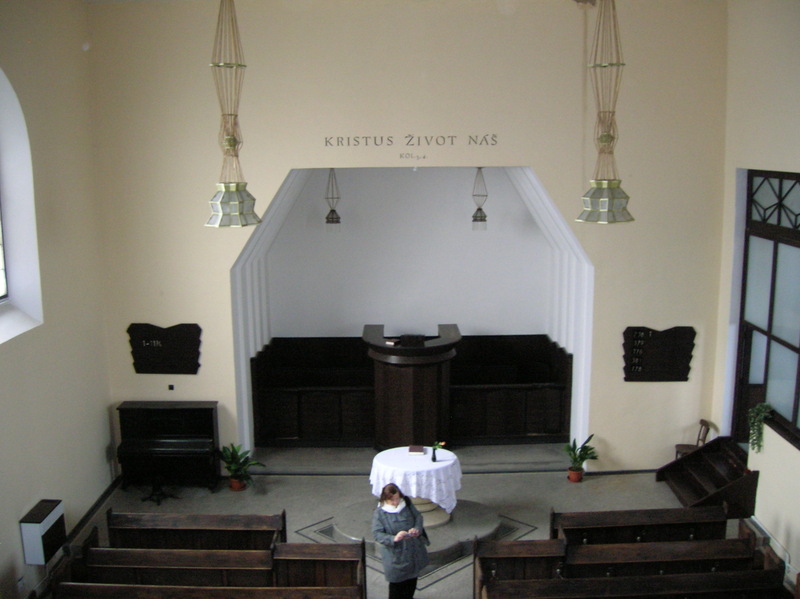 Designed by Oldřich Liška, the Cubist interior dated from 1914 to 1919. The church was adorned in new modern style with Cubist features. The pews, the pulpit and the organ all exhibit Cubist tendencies. Inside the church I was especially captivated by the four Cubist chandeliers and the star patterns engraved on the sides of the wooden pews. The Cubist elements blended in with the relatively stark interior, not making a glaring, loud appearance but rather embracing the church in a subtle, sensitive style. Next, the bus took me and the other 40-some passengers to another village called Libodřice, where, all of a sudden, a Cubist villa magically appeared. 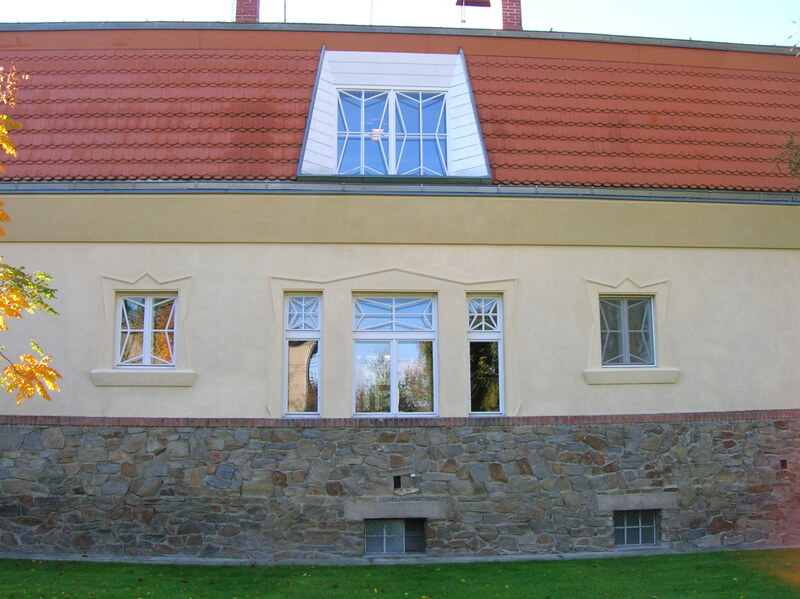 No other Cubist villa was located in the Czech countryside, I would find out. I was instantly reminded of a Cubist villa in the Vyšehrad district of Prague. I had walked by it every day on my way home from the when I lived below Vyšehrad hill. Passing by such an architectural wonder every day made me feel calm, momentarily at peace with the world and all the wonders it brings. I was especially drawn to the framed windows of the Bauer Villa, decorated in star patterns. The large mansard roof blended into the design as well. The abstract, broken shapes appealed to me. The villa boasted block stereometric articulation. Stereometric encompasses forms such as the cone, cube, pyramid and sphere – geometric shapes. Three polygonal buttresses were combined on one side of the villa. I was impressed with the slanted form of the main cornice, too. There were not just Cubist elements apparent inside and outside the villa; the entire building embraced the style in a form that did not disturb the tranquil landscape. Legendary Czech architect Josef Gočár, who made a name for himself during the early 20th century in the Czech lands, designed the Bauer villa early in his career, between 1912 and 1914. Later, this pioneer of architecture would devote time to the styles of Rondocubism, Functionalism and Constructivism. His works are scattered throughout the Czech landscape, featured in Prague, Pardubice and Hradec Králové, for instance. 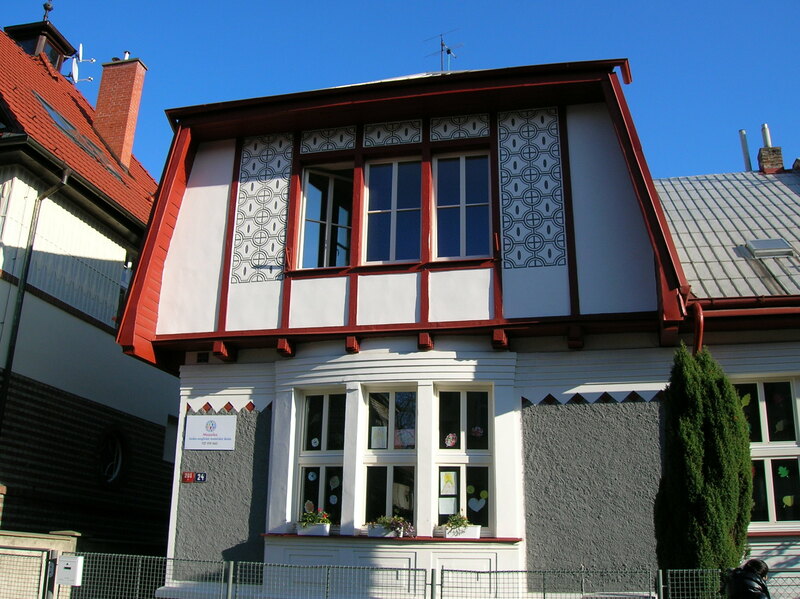 Gočár had studied under the tutelage of famous Czech architect Jan Kotěra, who had was influenced by late 19th century styles along with Modernism. In 1911 Gočár chaired the Cubist Group of Visual Artists. Its members included Pavel Janák (who had also worked with Kotěra); the Čapek brothers; Otto Gutfreund, a renowned sculptor who also fought in the Foreign Legion during World War I; and Vlastislav Hofman, who was accomplished in architecture, painting, graphic art, furniture design and writing. Hofman even designed about 400 sets for plays, including 200 for Prague’s National Theatre. A year later Gočár helped set up the Prague Art Workshops, designing Cubist furniture with Janák, who is best known for designing the Baba colony residential area in Prague’s sixth district. Gočár’s first major projects included a staircase for the Church of the Virgin Mary on a square in Hradec Králové during 1909 and 1910. 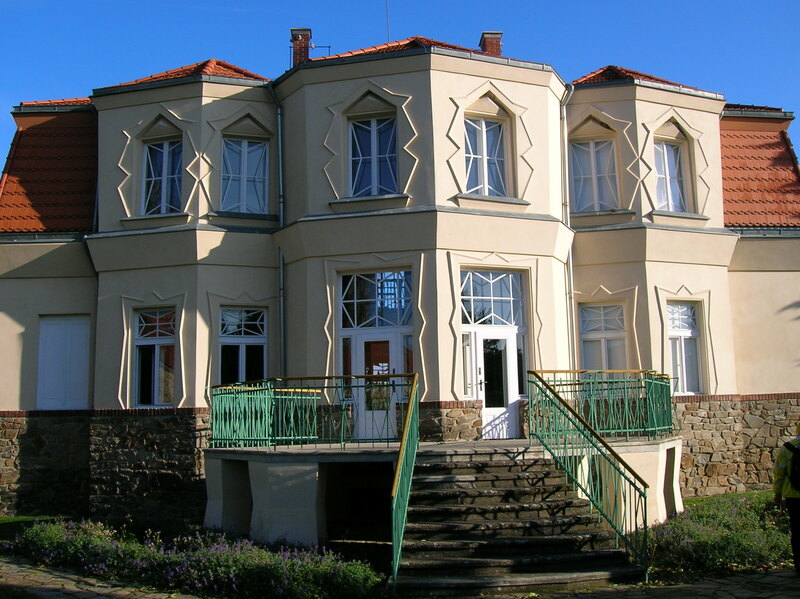 In 1910 he also designed the living quarters of a cavalry barracks in Bohdaneč. In Pardubice during 1909 to 1911 he designed the Winternitz automated mill and also concentrated on the Wenke department store in Jaroměř. In 1912 he was one of many Czech artists to convert to Cubism, utilizing simple geometric shapes juxtaposed without illusions of classical perspective. 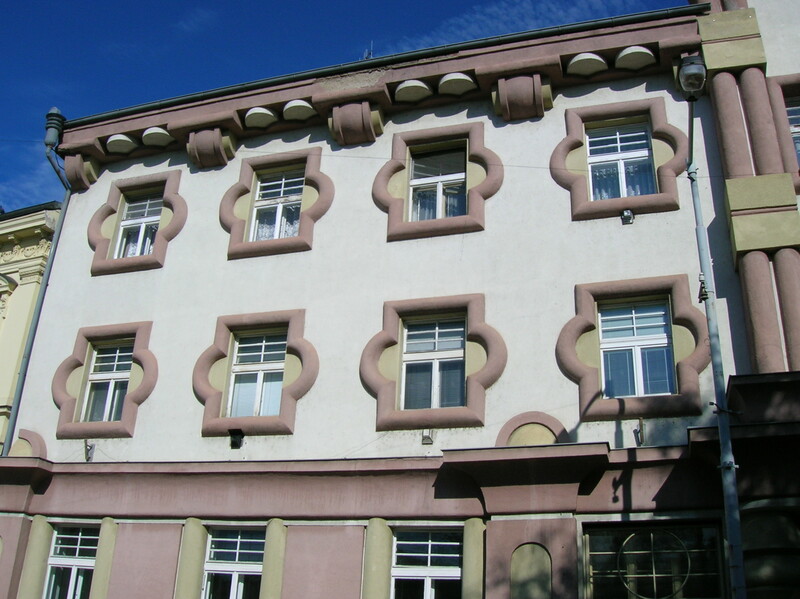 He teamed up with Janák to build the first Czech Cubist building in Prague – the reinforced concrete House of the Black Madonna, which featured angular, bay windows, a Baroque double roof and Cubist ironwork on the balcony. Like the Bauer Villa, the House of the Black Madonna did not interfere with the atmosphere. Instead, it complemented the historic environment of downtown Prague. The Bauer Villa was constructed for Jewish entrepreneur Adolf Bauer, who owned the manor farm estate. The investor and his family lived there from 1914 to 1929, when Bauer died of diabetes. Bauer’s widow remarried and moved to Prague with her two daughters, and from 1931 Antonín Illmann took care of the villa and the farm. The Jewish Bauer family was sent to their deaths during World War II. In 1941 Nazi Augustin Juppe moved in to what had been the Bauer family home. After the war the villa was occupied by administrative offices of the City Council. A hairdresser’s salon, a library and a few apartments also took up space in the villa. Finally gaining recognition, the Bauer Villa was accorded the status of a cultural monument in 1987. Despite that, it became more and more dilapidated. 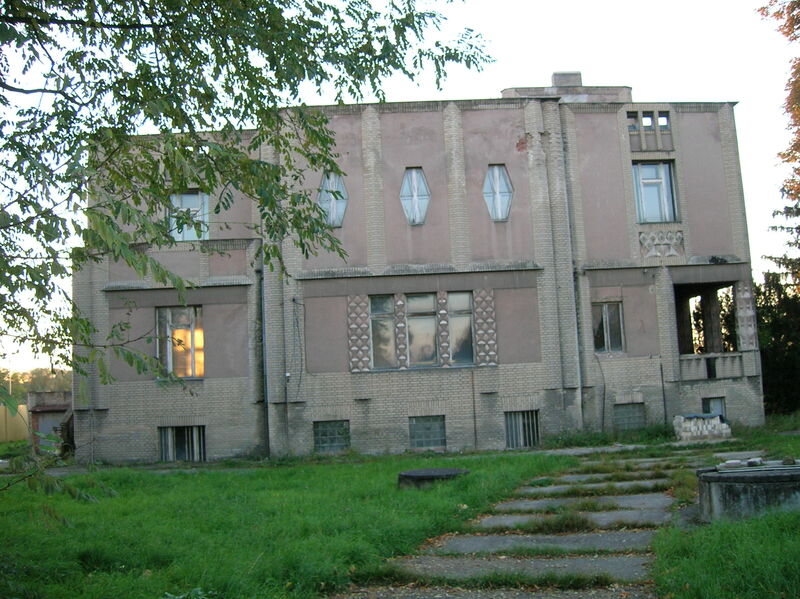 Its poor condition finally led the municipality to sell it in 2002 to the Foundation of Czech Cubism. Extensive reconstruction costing approximately 25 million Czech crowns took place, and the Cubist creation was open to the public during 2008. 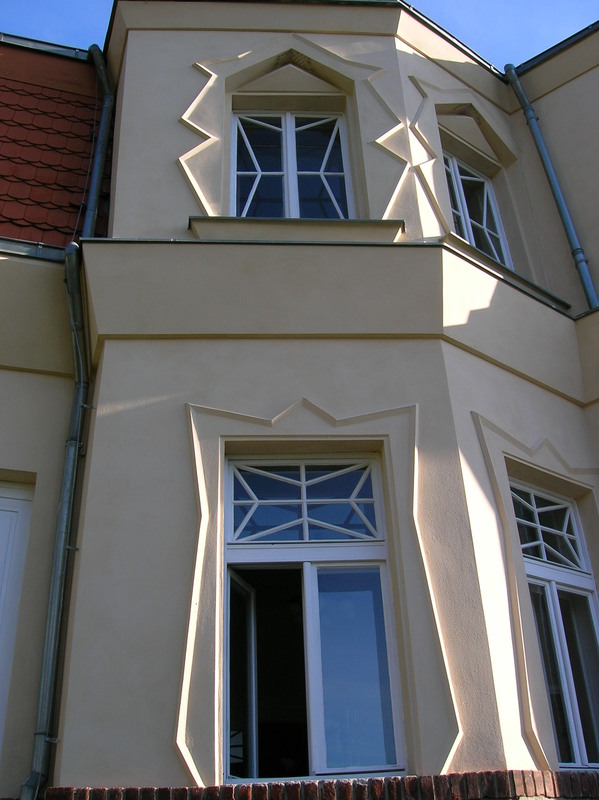 The expositions in the villa featured Cubist furniture, ceramics, paintings and sculptures as well as informative displays about the Bauer family, Gočár and about Czech Cubism in general. Today there is not much original furniture in the villa, though a few pieces had been salvaged – the fireplace, a wooden closet and the bathroom tiles. The central staircase hall had been inspired by British villa architecture. I was reminded of the staircase hall in Dušan Jurkovič’s villa in Brno. 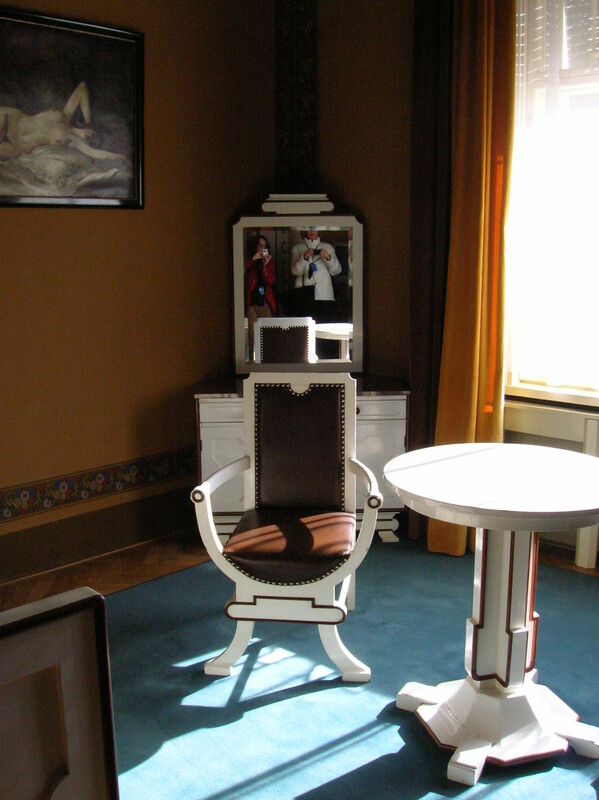 At the beginning of the tour, I was impressed with a unique coat rack in Cubist style and two chandeliers, one made by Janák and another by Ladislav Machoň, who would become a prominent exponent of Art Deco and Functionalist styles. Machoň’s designs dot Prague. His interior of the Law Faculty of Charles University is probably his best known work. There was also a dark, gloomy painting of Faust on one wall of the Bauer Villa. I wondered how the theme of Faust fit in with the Cubist movement, if indeed it did. In the bedroom I noticed a still life painting with a goblet by František Volf and a bewitching, black Cubist chandelier. The bedroom was joined with a bathroom on the ground floor. Usually, during that period, the bedroom and bathroom would be situated on the first floor. The living room featured furniture made by Hofman in 1911 and 1912, a wall clock and chandelier. I was especially intrigued by the Cubist flower pot with its cover in the same style. Then, again in the hallway, I admired the linocuts by Václav Špála and Josef Čapek, two of my favorite Czech Cubist artists. Then we went upstairs via a beautiful staircase. Exhibition Room II featured furniture by Gočár and sculptures by Gotfreund. In his sculpture “Anxiety” I was aware of a certain tension permeating from the female’s drapery. This work, made between 1911 and 1912, was considered the first Cubist sculpture, though the one in the room was not the original. Other objects on the first floor included tea cups, metal and brass boxes and vases designed by Hofman and Janák. The bedroom was Hofman’s design from 1912 to 1914 with a black Cubist bed, more sculpture by Gotfreund and a chandelier hailing from that era. The study featured the style of Rondocubism, an offshoot on Cubism born after the creation of Czechoslovakia in 1918. Rondocubism featured folk and nationalistic themes with curls, circles and folkloristic elements. I was especially impressed with Janák’s green chair made of walnut. Our guide had been informative and enthusiastic, and I was excited that I discovered another gem in the Czech Republic. I thought this would be a good half-day trip from Prague for foreigners visiting the capital city, but I doubted any tour agency offered such an excursion. The arsviva tour company’s excursions were in Czech, so it would only appeal to foreigners who were fluent in the language. I understood why Karlštejn Castle and Konopiště Chateau drew so many crowds, but still it was, I felt, highly regrettable too that such an extraordinary Cubist villa in the countryside should remain relatively unknown. Next on the itinerary was the Ratboř Chateau, also called the Chateau Kotěra, built between 1910 and 1913 for Bernard Mandelík, who owned a manor farm estate and sugar refinery. 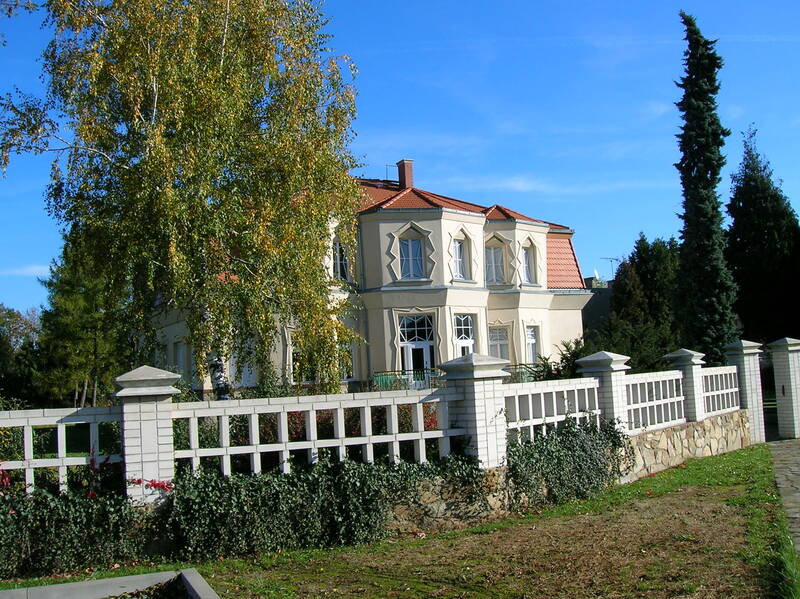 The new chateau (as opposed to the old chateau also on the estate) was designed in Czech modern style by Kotěra and served as a restaurant and hotel. It is notable architecturally for its vestibule, staircase and entrance to the restaurant as well as for its guest rooms. 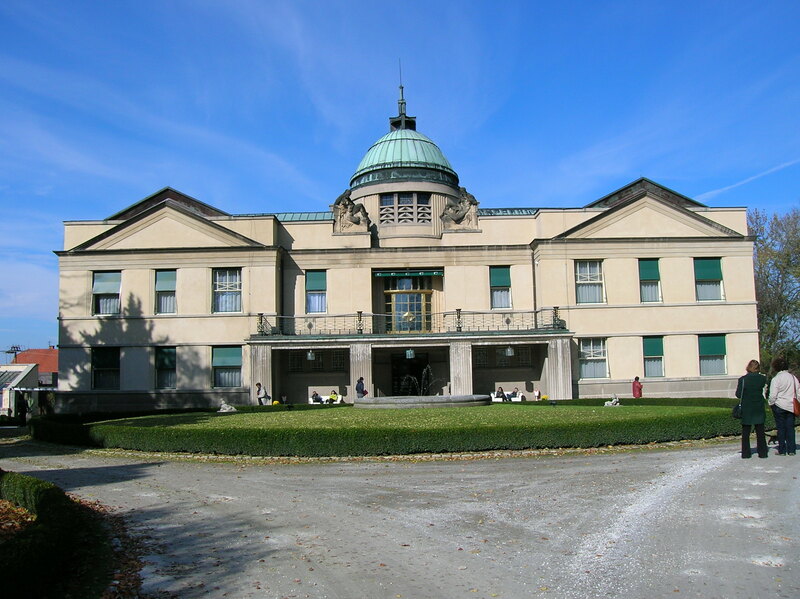 The building is frequently used for weddings and conferences, too, and it had its own parkland. A large, circular fountain stands in front of the façade. 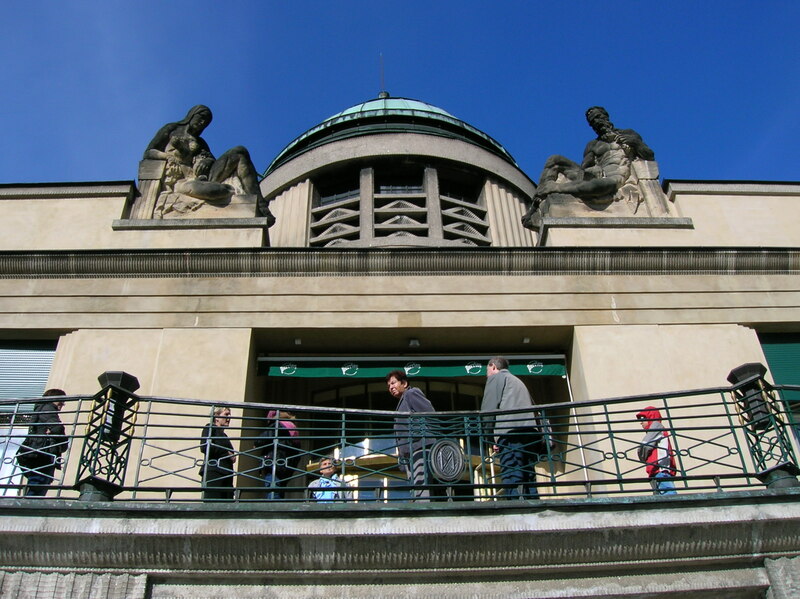 The cupola is decorated with two statues by legendary Czech sculptor Jan Štursa, who founded Czech modernist sculpture and was also an influential pedagogue. He began his career inspired by the symbolism of the Viennese Secession, and after World War I concentrated on depicting the horror and tragedies of wartime. He created a Cubist relief for the Mánes Bridge in Prague. In the first guest room we saw a bookcase that had been designed by Adolf Loos, who was known for his lack of ornamentation. A severe critic of the Viennese Secession when the movement had been in full swing, the Brno-born architect who had spent much time in Austria had focused on purism and minimalistic design. The walls were decorated in green and blue with a lovely plant motif. Another space featured original furniture, including a bed with canopy, table and bookcases. 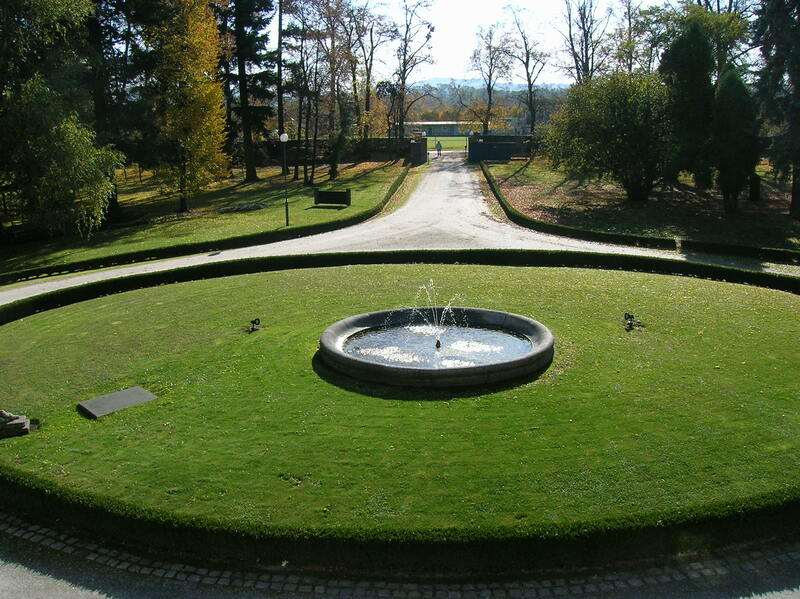 From the terrace there was an impressive view of the fountain and surrounding greenery with sculptures. It was also possible to see the statues on the cupola from a riveting, close perspective. A medallion sporting the letter “M” standing for the Mandelíks in green with dark brown wood decorated the railing. In another bedroom I was impressed with a Cubist bedframe and a Cubist chandelier that spoke of simplicity with a sense of style. After lunch we visited Cubist creations in Kolín and Poděbrady. In Kolín I saw the main square for the first time, and the Neo-Renaissance town hall caught my attention as did the Baroque facades, plague column and fountain. We gazed at Rondocubist apartment buildings dating from 1921 to 1923, the former town savings bank from 1926, the municipal theatre dating from 1937 to 1939 and a high school with magnificent Cubist elements, especially the windows, designed in 1924. The bridge across the Labe River was architecturally impressive and had been built during the 1920s. 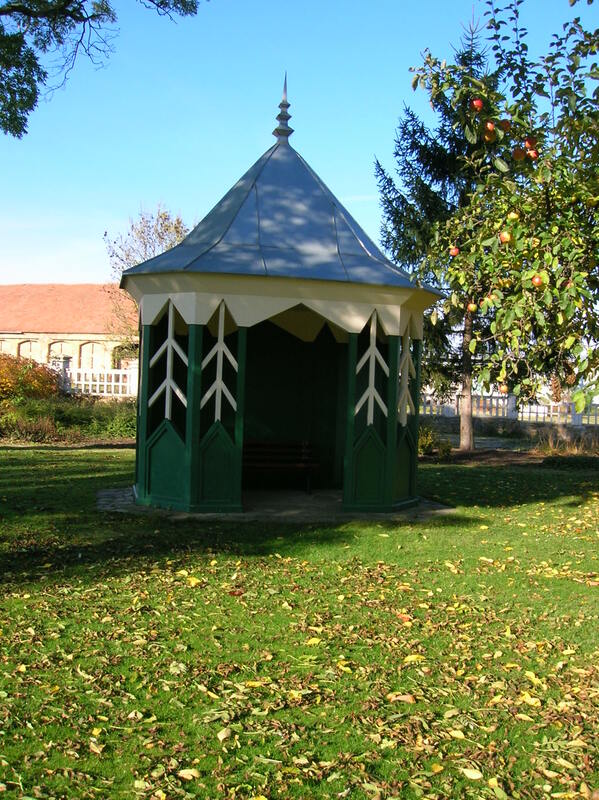 In the spa town of Poděbrady, we walked through a beautiful park and a neighborhood rich with villas with Cubist elements. 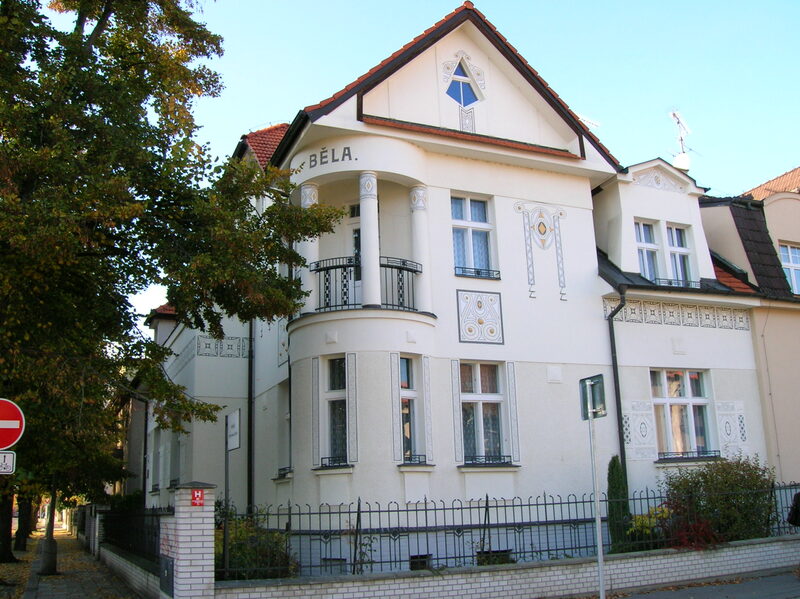 At our second to last stop, in Poděbrady, we were able to admire the Amálka Villa from 1910, the Kouřimka Villa from 1909 to 1910 and the Obereigner Villa from 1898. We also took in the spa buildings on the promenade, fascinating structures designed by František Janda from 1907 to 1911. Previously, I had only changed trains or buses in Poděbrady, never realizing how much there is to see here. While we were in Poděbrady, we had extra time to spend in a café famous for its desserts. Unfortunately, it was also famous for its poor service as it took the waiters an agonizingly long time to fetch coffees and cakes. I was joined by a friendly and interesting family, an adult son with his parents. He had given his parents this trip as a Christmas present the previous year. I talked to them about my baseball and ice hockey careers growing up, attending Jaromír Jágr’s summer training camp in Slaný and sights I had seen in the Czech Republic. The father and I reminisced about Czech and Slovak hockey players who had defected to the NHL some decades ago. For me the names Peter Šťastný and Milan Nový brought back childhood memories. In my opinion, the highlight of any tour was meeting nice people, no matter how exciting the particular excursion might be. I have had some negative experiences in the country over 21 years, but meeting kind Czechs always has always made the hardships worthwhile. On the way back to Prague, we stopped at the Beniesova Villa in Lysá nad Labem. 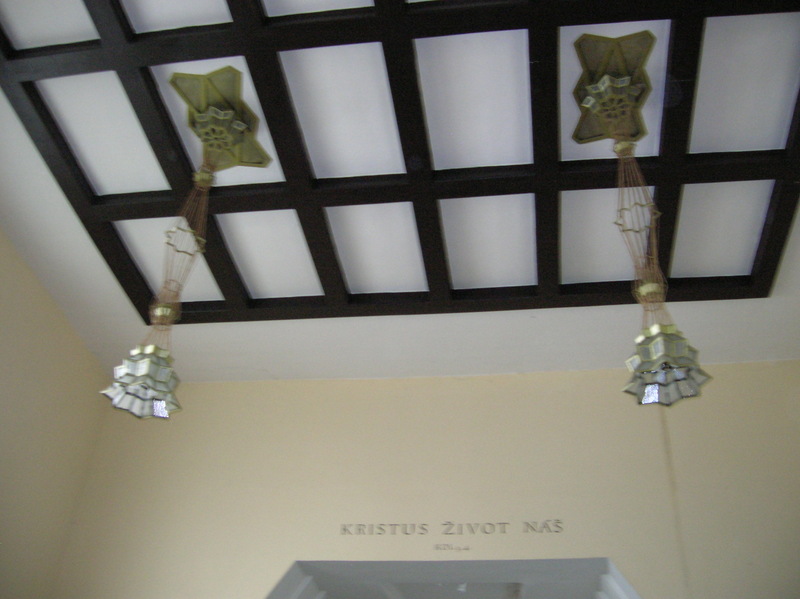 The villa, created by Emil Kralíček for the owner of a sugar refinery, is known for its big entrance hall with light roof window in the shape of the Star of David and crystal motives that denoted the process of manufacturing sugar. It was sad, though, to find the villa in such a dilapidated state. The villa was fenced off; there was no possibility to see what sounded like a ravishing interior. If only someone had donated enough money to restore it to its original beauty. . . . If only. . . . It depressed me to think that people could let such architectural wonders fall into such poor condition, that there was not enough money to restore significant buildings to their former splendor. My depression ceased by the time we returned to Prague around seven in the evening. I felt grateful that I had had the opportunity to make new friends and to go on such a fascinating excursion.